Gum grafts are a great way to fix a “toothy” smile and put a fast stop to mouth-ruining gum disease that can cause tooth decay, bone loss, and more. If you have too much gum, the same techniques can help take care of that, too. A gum graft is a group of different procedures MYsmile uses to cover an exposed tooth root with gum tissue. Gum grafts can either thicken up areas where your gums are thin, or be used to cover areas where your gums have receded completely, leaving the root of your tooth exposed. Gum grafts—or sometimes even gum removal—can dramatically increase your smile’s natural beauty if you have a smile that’s too “toothy” or “gummy”. Do I need gum grafts? Whether or not you need gum grafts is dependent on whether or not you have gum recession. Some common reasons for receding gums are natural aging (some people are genetically predisposed to receding gums over time), over brushing or aggressive brushing, smoking, some body piercings that rub on the gums, and poor oral hygiene. 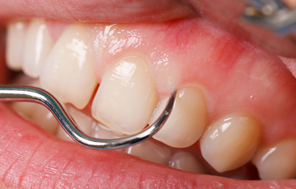 All of these things and more can cause your gums to recede. Some symptoms of gum recession include a “notch” between your teeth at the gum line, your teeth looking longer than before, your teeth being more sensitive, or a visibly exposed root. If you have any of these, schedule a consultation with Dr. Kamel! In mild cases, a tooth scaling from Dr. Kamel and proper home brushing techniques can help stop the gum recession. If that’s not enough to treat your case, Dr. Kamel might recommend gum grafts for you. What kind of problems can a gum graft treat? Gum grafts can be restorative or purely cosmetic. If you have a toothy smile, a gum graft can help shape your teeth and give you a perfect look. Gum grafts can also fix oversensitivity in your teeth, especially if the root of your tooth is exposed, which can make eating and drinking extremely painful. Gum grafts can also help prevent bone loss. Gum disease is no laughing matter: It can progress quickly and damage the underlying bone structure, resulting in bone loss. Gum grafts can stop this process before it starts, or stop any more damage from happening. What does getting a gum graft involve? Many people get spooked by the fact that a gum graft is a surgical procedure, but there’s no reason to be. Dr. Kamel’s gum grafts are performed under local anesthetic as an out-patient procedure, making it a very minor surgery. Your donor tissue comes from your own palate, and is moved to your gum line with minimal muss or fuss. Both the donor and recipient sites heal relatively painlessly. I think I need gum grafts. How do I get started? If you’re ready to book a consultation for gum grafts, contact MYsmile to book today! Dr. Kamel will help you decide if gum grafts are right for you. Have a question about gum grafts? MYsmile has the answer. Don’t see your question here? No problem—just Ask MYsmile! If you want real information, real patients, or real results on MYsmile’s gum graft treatment, you’ve come to the right place. Want to see the difference MYsmile’s gum grafts can make for you? Real photos, real patients, real results. Check out what others are saying about MYsmile’s gum graft treatment!